The variants like E, S and SV are are blessed with a set of 15 inch steel rims, while the remaining trims are blessed with stylish set of alloy wheels. These wheels are covered with 175/65 R15 sized tubeless radial tyres. This Honda City sedan is one of the safest in its segment, thanks to the dual front SRS airbags that safeguard the driver and co-passenger from fatal injuries along with ACE body structure, Dual front SRS airbags for driver and passenger, ABS with EBD, Reverse parking camera, Immobilizer, Rear windscreen defogger, LED high mount stop lamps, Front Fog Lamps. This sedans dashboard is equipped with a stylish three spoke steering wheel that is mounted with multi-functional switches. Furthermore, its CVT version also gets its steering wheel with paddle shifters. 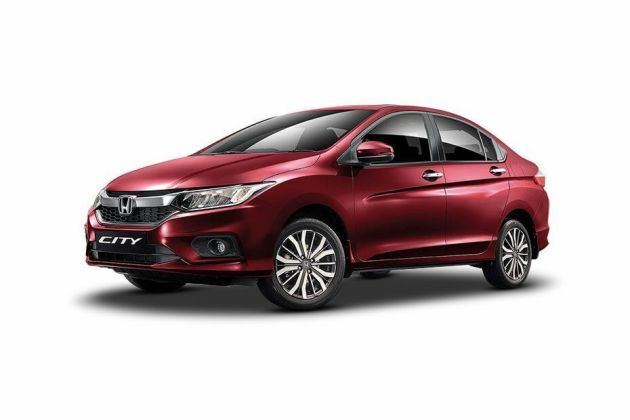 The Honda City gets a three-spoke steering wheel that is leather wrapped on the VX and ZX trim levels. A brushed aluminium insert runs along the lower edge of the three spokes to form a y-shape. Integrated telephony and audio control buttons are available from the SV variant onwards. Push-button start/stop functionality is on offer on the V, VX and ZX variants. The button is backlit in white and red colours., Competition Check: The Hyundai Verna gets push-button start/stop feature only on the top-of-the-line SX(O) trim level. The Honda City comes with a three-pod instrument cluster. The largest pod in the centre houses a speedometer, with a section of it being used for displaying the warning lights. On the left, you have a tachometer, while on the right is a circular MID screen, which displays all important information, including average and instantaneous fuel consumption, distance to empty, a trip meter, outside temperature, clock and others. Besides these, the MID pod also displays the fuel gauge and temperature readings. 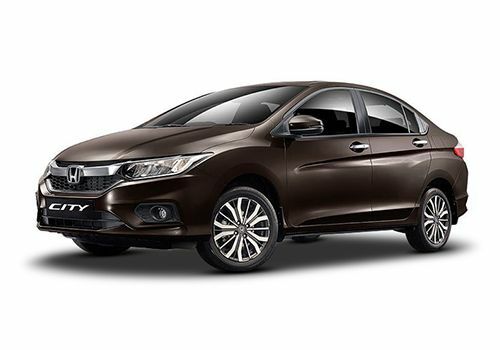 The Honda City gets an automatically adjustable day/night inside rearview mirror (IRVM) on the VX and ZX variants. This helps in reducing the glare from headlights of trailing cars during the night. Meanwhile, lower variants come with manually adjustable day/night IRVM instead., Competition Check: The top two variants (SX and SX(O)) of the Hyundai Verna get an electrochromic mirror (ECM), while a manually adjustable IRVM is offered on lower trim levels. All variants of the Honda City come with dual front airbags (driver and co-passenger), along with anti-lock braking system (ABS) and electronic brake force distribution (EBD) as standard. Additionally, the top-of-the-line ZX trim also gets side and curtain airbags, thus enhancing the car’s safety proposition further., Competition Check: The Hyundai Verna comes with dual front airbags (driver and co-passenger) with ABS as standard on all variants, while the range topping SX(O) trim also gets side and curtain airbags. Meanwhile, the Maruti Ciaz is equipped with two airbags, along with ABS and EBD on all variants. An electric sunroof is on offer on the VX and ZX variants of the Honda City. , Competition Check: The Hyundai Verna gets an electric sunroof on the top-of-the-line SX(O) trim level and the SX AT variant. Meanwhile, the Maruti Ciaz doesn’t come with a sunroof on any variant in its lineup. Except the base-spec S trim, all variants of the Honda City come with rear AC vents, one for each side. The knobs on the AC vent console get a chrome accent as well. An automatic climate control unit is available from the SV variant onwards. The controls are touch-sensitive, which makes the console look neat, thanks to the absence of any physical knobs or buttons. However, it becomes slightly tricky to operate the climate control system while driving the car, as the driver does need to take his/her eyes off the road to make any adjustments. Transmission duties on the Honda City are handled by a 5-speed manual on the petrol models and a 6-speed manual on the diesel variants. Additionally, there is a CVT automatic gearbox that is only on offer with the petrol engine option. , Competition Check: The Hyundai Verna comes with the choice of a 6-speed manual or a 6-speed automatic with the 1.6-litre petrol and diesel engines. The 1.4-litre petrol powerplant, however, gets only a 6-speed manual gearbox. Meanwhile, the Maruti Ciaz comes with a standard 5-speed manual gearbox on both diesel and petrol engines, while a 4-speed automatic is available with the petrol engine. The Honda City gets a 7.0-inch touchscreen infotainment system on the V, VX and ZX variants. These variants also come with MirrorLink smartphone connectivity, 1.5 GB flash storage, in-built satellite navigation, Wi-Fi support, and voice recognition. Meanwhile, the S and SV variants come with a 2-DIN music system instead. , Competition Check: Top variants of the Hyundai Verna and Maruti Ciaz come with similar touchscreen systems, though both the models are equipped with Android Auto and Apple CarPlay functionalities. The Honda City comes with all LED headlamps on the VX and ZX variants, while lower trim levels come equipped with conventional halogen bulbs instead. Integrated LED daytime running lights (DRLs) are standard across the range. , Competition Check: The Hyundai Verna comes with projector headlamps, cornering lights, and LED daytime running lights (DRLs) & positioning lamps on the SX and SX(O) trims, while the E and EX variants get halogen bulbs. Meanwhile the Maruti Ciaz features projector headlamps with LED DRLs on the higher variants. Front fog lamps are available from the V trim level onwards. They are illuminated by halogen bulbs on the V variant, and LEDs on the VX and ZX trims. The circular fog lamps are placed inside large pentagonal housings located on the extreme ends of the front bumper. Like all latest Honda cars, the City too gets a prominent chrome bar on the front grille, with Honda’s ‘H’ logo placed in the middle. Also visible here is the mesh pattern that lets air inside the engine bay. Body-coloured outside rearview mirrors (ORVMs) are standard on all variants of the Honda City. They also get integrated turn indicators from the SV variant onwards. The V, VX and ZX variants of the Honda City come with a chrome finish on the outside door handles. The S and SV variants get body-coloured door handles instead. The top-of-the-line ZX trim comes with automatic intermittent wipers with rain sensors. This variant also gets automatic headlight control with light sensor and headlight auto-off timer. From the SV variant onwards, the Honda City comes with a shark fin antenna that is located on the rear section of the roof. Meanwhile, the entry-level S variant gets a pole-type antenna that is mounted on the front section of the roof. The Honda City offers a boot space of 510 litres, which is similar to what is available with the Maruti Ciaz, but bigger than the 480-litre boot of the Hyundai Verna. The top two variants (VX and ZX) come with 16-inch multi-spoke diamond cut alloy wheels, while the V trim gets 15-inch diamond cut alloys. The lower trim levels (S and SV) get steel rims with full wheel covers.